Click on image to download PDF version of handout. Science, technology, engineering, and mathematics are commonly grouped and known as STEM for short. This acronym is meant to symbolize the relationship that each of these disciplines has with the other, is a grouping for initiatives in K-12 education, and serves as a designation for a group of careers that are in demand and a national focus in the United States. On this page, LEARN how STEM Careers are in demand, why these careers are super important, and how a career in STEM can be a great choice for you and EXPLORE STEM Career opportunities. Why are STEM Careers important? Did you know that jobs in STEM are essential to our health, happiness, and safety? Did you know that STEM professionals are creative and collaborative problem solvers? Did you know that jobs in STEM make a world of difference and shape our future? Is a STEM Career right for me? Do you like to solve interesting and challenging problems? Do you like to be creative and work with others? Do you like to work on projects that make a difference? Do you want to earn a good salary and enjoy job flexibility? If so, then a STEM Career would be a great choice for you! Why are STEM careers in demand? The science and engineering (S&E) workforce has shown sustained grown for more than half a century. The number of workers in S&E occupations grew from about 182,000 in 1950 to 5.4 million in 2009. This represents an average annual growth rate of 5.9%, almost five times the 1.2% growth rate for the total workforce older than age 18 during this period. Workforce growth in S&E occupations from 2000 to 2009 was slower than in the preceding two decades. Nonetheless, at 1.4% growth annually, it exceeded the 0.2% growth rate for the general workforce. In addition, many workers outside S&E occupations have STEM training or use related knowledge and skills in their jobs. In fact, seven out of ten of the fastest growing occupations (requiring at least an associate degree) are in STEM fields. What is driving STEM Career growth? Every day that you wake up and get out of bed, you should be reminded why STEM matters. I challenge you to name one thing you have used in the past week (or ever) that hasn’t been touched by an engineer (who uses science, math, and technology to create the new technologies you love – or hate). Spoiler alert: you won’t come up with anything… and if you do, email me, because I bet I can help you figure out how an engineer was involved somewhere along the way. The demand for technology continues to grow: if it is not the next best iPhone, it is the medical equipment and devices that are helping doctors save lives. The National Academy of Engineering has outlined 14 grand challenges for the 21st century that will require all levels of STEM professionals: from assembly line workers trained to use highly technical machines, to PhD astrophysicists. 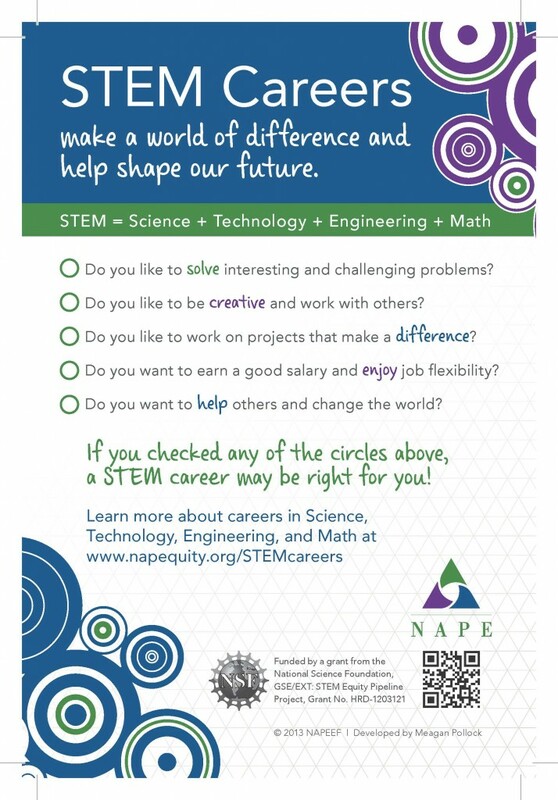 Want to know more about careers in STEM? Browse through detailed information on over 100 careers to discover what STEM professionals really do and what it takes to prepare for these careers. Each career profile provides basic career information such as salary, job outlook, degree requirements, etc. Also included are videos featuring interviews with real scientists or on the job profiles. Explore now! The Salary Calculator will ask you for information relating to education, employment history, and other factors, to create the most accurate compensation and employment guidance available. Excellent tool for comparing various levels of education, jobs, and locations. Changing the Conversation: The goal of this website is to promote broad implementation by the engineering community of the findings and recommendations presented in the 2008 NAE report, Changing the Conversation: Messages for Improving Public Understanding of Engineering. Department of Energy women in STEM videos. DiscoverE works together to celebrate engineering and give students hands-on experiences with engineering. eGFI Meet a Student: Find out why these students chose engineering. Engineer Girl: This website is designed to bring national attention to the exciting opportunities that engineering represents for girls and women. Helps students understand who engineers are, what they do, and how to become one. Engineer Your Life: This website provides a guide to engineering careers for high school girls. Girlstart provides a year-round, intensive suite of STEM education programs for K-12 girls. Grand Challenges for Engineering: The NAE has identified 14 areas awaiting engineering solutions in the 21st century. With the Is There an Engineer Inside You app, you can turn yourself into a top-notch engineering student and become a successful engineer with the ideas and information in this one-of-a-kind resource. iSeek Careers provides videos for a variety of careers. iWASwondering.org is a project of the National Academy of Sciences intended to showcase the accomplishments of contemporary women in science and to highlight for young people the varied and intriguing careers of some of today’s most prominent scientists. Kids Ahead: This website is an initiative to increase the number of children with STEM competencies and interests. The site is designed to inspire young people to learn about STEM through innovative interactions in the physical and virtual worlds. A Kids Guide to Engineering provides ways to explore engineering and to begin thinking like a specialized problem solver. MIT Blossoms provide math and science videos and lesson plans. Nepris has created an award winning online platform that connects students in the classroom to industry professionals. P21‘s mission is to serve as catalyst for 21st century learning to build collaborative partnerships among education, business, community and government leaders so that all learners acquire the knowledge and skills they need to thrive in a world where change is constant and learning never stops. Purdue has produced a parent’s guide to introducing children to engineering. Sally Ride Career Cue connects students to STEM professionals. SciGirl fromPBS: Each half-hour episode highlights the processes of science and engineering, following a different group of middle school girls who design, with the help of scientist mentors, their own inquiry-based investigations on a variety of topics. Spark 101 delivers dynamic, real-world STEM content to classrooms. *Special thanks to Meagan Pollock and High Tech High Heels™ for their identification, selection, consolidation, and contributions of this content.